In large microwavable bowl, mix cereal, corn snacks, chow mein noodles, pretzels and peanuts. In microwavable measuring cup, microwave butter uncovered on High about 30 seconds or until melted. Stir in garlic powder, soy sauce and chow mein seasoning mix with wire whisk until well mixed. Pour over cereal mixture, stirring until evenly coated. Microwave uncovered on High about 3 minutes, stirring after every minute, until mixture looks dry and crisp. Spread on paper towels; cool 15 minutes. Place in serving bowl; stir in wasabi-coated peas. Store in airtight container. Wasabi is the Japanese version of horseradish and has a sharp, pungent, fiery flavor. 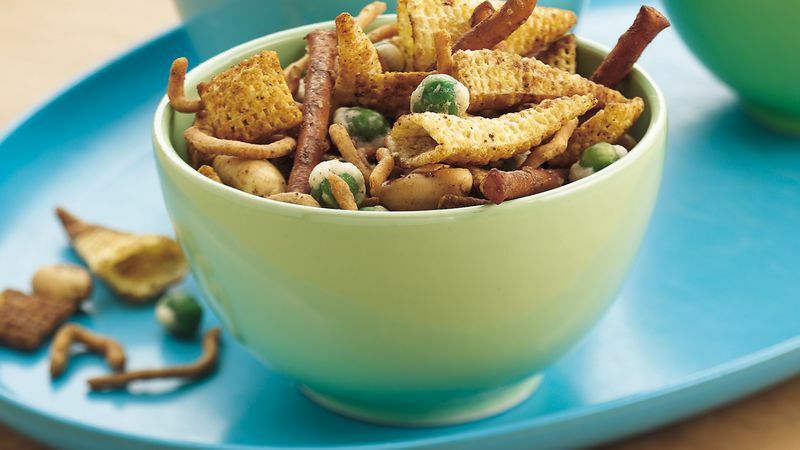 Wasabi-coated peas add a fiery sweet flavor to the snack mix. If you choose not to use them in this recipe, substitute 1/2 cup sesame sticks. This recipe is a national contest prize winner created by Michelle Grosella from Perkasie, PA.
Oven Directions: Heat oven to 250°F. In ungreased 13x9-inch pan, mix cereal, corn snacks, chow mein noodles, pretzels and peanuts. In 1-quart saucepan, melt butter over medium heat. Remove from heat. Stir in garlic powder, soy sauce and chow mein seasoning mix with wire whisk until well mixed. Pour over cereal mixture, stirring until evenly coated. Bake uncovered 30 to 35 minutes, stirring after 15 minutes, until mixture looks dry and crisp. Spread on paper towels; cool 15 minutes. Place in serving bowl; stir in wasabi-coated peas. Store in airtight container.